Go Green wants share with you its first own green activity. We offer a free dive to the first 20 divers that sign up for this nature initiative. If you are in Bayahibe the 20th of March we would be delighted to invite you to do something great for the environment: TO CONSERVE THE CORAL REEFS HABITAT. 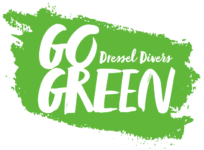 We will take a boat and we will go together to a coral area where both, divers and instructors will clean-up the coral reefs and we also will remove all the marine debris we find during the journey. With your active involvement you can help us to achieve our main goal: To increase the awareness of Coral reefs value for the nature balance. It is also important for GO GREEN that people realize that plastics represent the 80% of the marine pollution. This is the first step, but we will keep developing different GO GREEN activities around the Caribbean area. It is time to do little great actions that make this planet a better place to live. Get on board! The divers committed to the environmental protection will have the opportunity to share both passions and all the participants will receive, besides the dive for free a very special souvenir. Come and share with us this Go Green experience. Take action and leave your green print for future generations! GO green is proud of you!! !